Irish silk scarf designer Ciara Silke is established since 2014. Her beautiful silk scarves are hand designed in her studio in Galway, Ireland. Ciara’s design process mixes bold imagery with luxury fabrics. She uses unconventional colour schemes and hand rendered print techniques —the result is vivid and compelling scarves. Her signature line consists of feminine, classic scarves, which, when draped, gathered or tied, lend the perfect touch of allure and distinction. Her design philosophy embraces simplicity and innovation while exploring colour to its fullest extent. Ciara worked with one of the best design houses in the world (DVF) before starting her label. She has a degree in printed textile design from the National College of Art and Design, Dublin. Since launching her label she has appeared in British Vogue and in 2015 one of her silk scarves was worn to the Oscars® ceremony. Ciara is a silk scarf designer and artist who has always been fascinated by the tactile feel of fabrics – working with silk and other natural fabrics is her passion – experimenting with the ways in which these fabrics change colour with certain tones, pigments, and printing techniques, provides endless inspiration for her work. Ciara Silke is a brand that makes beautiful designs – bringing style into everyday life. The brand is about melding classic and contemporary in personalized designs, rather than simple mass production. 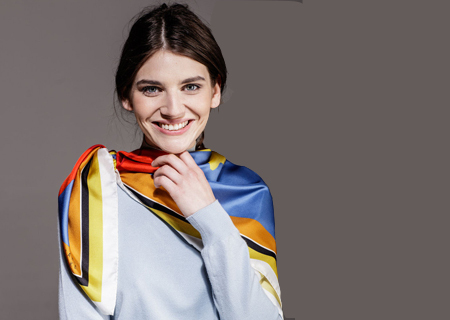 Since its inception the Irish scarf label Ciara Silke has gained a loyal following of dedicated customers and admirers along with numerous industry accolades. Ciara launched the Ciara Silke brand because she’s a passionate believer in the value of colour, design, and textiles. She wanted to develop an exclusive line of luxury accessories such as silk scarves and foulards focusing on the highest standards of quality in production. In 2017 Ciara Silke received a Design Excellence Award from the Design and Crafts Council of Ireland. The company remains dedicated to the concept of ‘handmade’ fashion. Although the brand has significantly expanded since 2014, the growth has been organic and it remains an independent company with a small passionate team. The core of our vision and success are our crafts people in Como, Italy – home to a highly skilled silk printing tradition since the 19th century. Ciara Silke is a silk scarf designer based in the west of Ireland. Having worked for some of the top fashion companies in the US she decided to experiment with natural materials and colors to create her very own scarf line. She studied fashion and textile design in NCAD Dublin. From there she went onto work for the iconic Diane Von Furstenberg label in New York. She spent many seasons there, developing her design skills, pattern skills and learning about the business side of design and manufacture. specializing in a luxury line of silk scarves – a line inspired by the beauty, colours and majesty of the iconic Connemara landscape and the wildness of Galway Bay. Each piece is individually designed in Ireland by Ciara, printed on fine silk and cashmere textiles in Como, Italy and hand finished in Galway. Ciara Silke fuses the wildness and vibrancy of her West of Ireland heritage with a modern, sleek, and timeless style, rendered in striking colours and fine Italian fabrics.